Strange Blue Women came into Division 1 Nationals seeded 10th, after a strong performance on the second day of Outdoor Regionals in Leicester. The conditions in Nottingham were very average on the first day of the tournament with a bit of cross-wind and white cloud. The team was the same as the Regionals squad, minus Beth Boucher, and with a special appearance from Charlie Daffern, of SB Mixed Captain/GBU24 fame. Unfortunately, due to Beth Boucher’s absence, and a very injured Laura Rogers, our team was noticeably cutter-heavy, leaving Tasha Smith as the only player on the squad who actively wanted to handle. Fortunately, Charlie Daffern, Becca Harwin, Jo Starkie and Lizzie Pearmain stepped up to the position, proving to be valuable assets to the signature SBW horiztonal stack that had served the team so well at regionals. SB got off to a slow start, with Leeds demonstrating an attack on the disc and slick offence movement that we struggled to keep up with. The slightly windy conditions took a bit of adapting to, with both sides throwing away some of the slightly longer discs. Although the game started off fairly evenly with point-trading, Leeds ended up taking the game, scoring 7 goals over Cambridge’s 4. Cambridge came out not knowing to expect from St Andrews, a Scottish team with which we had very little experience of. SB started strong, with the Ho-Stack improving dramatically from the teething problems experienced in the Leeds game. The teams in this game were very evenly matched, with points dragging on for up to 10 minutes (much to the sideline’s frustration). On Defence, Cambridge showed some great resilience, with strong forces from Charlie Daffern and Catherine Tran making sure that the Offence was often limited to handler movement instead of break throws up the field that would have gained significant yards towards the end zone. SB ran some great offence and defence in this game, and St.Andrews were a super fun team to play against, shame we don’t get to see them more often! The final game of the day. The wind had picked up slightly, and Cambridge went into the game straight away without any break after the St.Andrews game. Through tired legs, SB were determined to push through to secure a victory against Brizzle. Again, the game was very evenly matched, with more of the long, well-fought points we saw in the St Andrews game. Offensively, Cambridge used the full length and width of the pitch, using the handler dump passes and some great longer hucks from Charlie Daffern to Humaira Bhadelia rewarding SB with some solid goals. When time went, SB were 7-3 up, and confident that the end was in sight. However, Bristol fought back with commendable determination, and Cambridge struggled to hold onto their advantage as Bristol eventually took the game to universe point, winning 5 points in a row. Strange Blue struggled to keep their heads in the game in the final quarter of this game, as Bristol continued to score goal after goal and gradually diminishing our chances at victory. 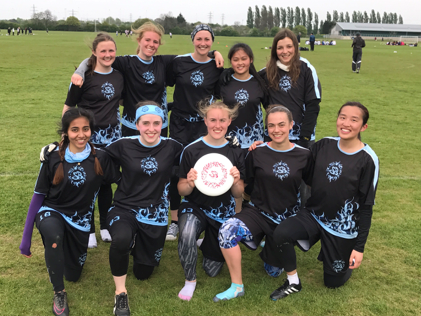 A very long Universe point ended with Bristol catching an IO break disc in their end zone, leaving Cambridge in second place after an incredibly long game. Sunday was considerably more windy than the previous day, immediately creating difficulties for everyone in terms of the completions of basic throws. SB came into day 2 of the tournament in 13th position, off the back of 2 incredibly close matches against St Andrews and Bristol. In the first few points, Cambridge pulled ahead, scoring a smooth upwind point against Warwick’s man defence. Shortly after this, they switched to zone, which proved to be a game changer. Offensively, Cambridge women struggled to progress the disc up the field, restricted to handler swings for much of their possession. Lizzie Pearmain adopted some great positioning as a cutter, receiving several discs threaded through the Bears’ zone. On defence, SB concentrated on running down every single disc, as the wind was severely messing up Warwick’s vert-stack and deep cuts. Catherine Tran had some really really great forcing on the Warwick’s strong handlers, showing great improvement as one of the only freshers on the team! Nevertheless, Warwick pulled ahead after a few long points, emerging victorious at the end of a tough game to start the Sunday on. The rematch to end all rematches. We knew Imperial would bring their A game, to get revenge on the climatic game to end regionals, which saw Cambridge beating the Ducks on Universe point (thanks to a sick catch from Jo Starkie in the end zone). The wind was an unhelpfully significant factor in this game, which was rather unfortunate, as it would have been a great opportunity to whip out some of Charlie’s longer throws. Despite a valiant effort from SB, with some slick offensive action from Katie Tidd and Humaira Bhadelia in the end-zone more than once, we lost. We’ll get ‘em next time gals. This game was a killer. We went in after 5 losses, determined to walk away from the tournament with at least 1 win. Alas it was not to be. We had been informed that Loughborough was a fairly young team this year, with an inexperienced squad relying on the throws of some super experienced women (including a GBU24 player or 2). With this in mind, SB made use of a poach on defence by Tasha Smith, in the open under lane, which significantly slowed down their offence (could have been that, or the wind. Hard to say). Loughborough worked us really hard, with some incredibly long and frustrating points. The wind slowed everything down to a large degree. To make matters worse, SB women were dropping like flies thanks to various injuries. T’was not good. But it was also great to have a challenge, and we were really really close to winning. Pros and Cons. Fi Chang had some great cuts on offence in this game, pushing through an ankle injury to score an upwind point for Cambridge. Again, this game was taken to Universe point. The disc moved up and down the field like a ping pong ball, as both teams fought hard to keep possession and then threw it away metres away from the end-zone. Frustrating, it was. On Offence, Tasha increasingly resorted to wanging the disc as far down the field as possible, with the intention of turning Loughborough just outside our enszone. (“don’t worry about catching these hucks guys, territory game.”). But it was to no avail. Loughborough threw a disc down the line into the end-zone, which was caught to end a seemingly never-ending game. Both sides were relieved. So we lost all of our games, but we won SPIRIT! Super proud of the Strange Blue Women- losing is not fun, but we knew being in Division 1 was going to be a challenge, and if anything it was a learning experience, and a chance to play some really solid teams. And thus endeth the reign of Katie and Tasha as SB Womens Captains. Thanks gals, its been a ride. *Mic Drop*.